If you’re just getting started with Weight Watchers, you might be wondering if you can actually lose weight while still enjoying delicious meals. The short answer? Absolutely. Just because you’re watching your weight doesn’t mean you’re stuck with unsatisfying meals that are less than appetizing. 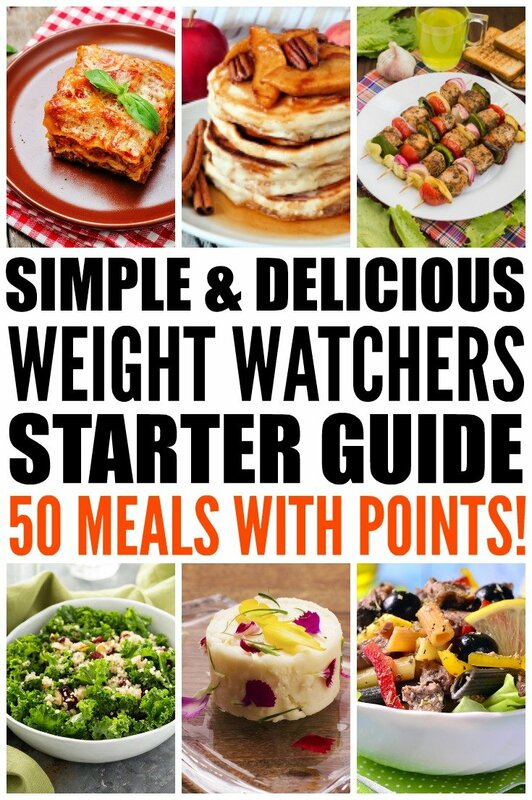 Thanks to the Weight Watchers website and of course our good friend, Pinterest, it’s easy to find delicious Weight Watchers meals with points that suit your taste buds and keep you on track to lose weight! The Weight Watchers point system (SmartPoints) is based on calories, sugar, saturated fat and protein found in the food you eat. While sugar and saturated fats increase the points, protein lowers the number of SmartPoints. The goal is to help you eat better and make healthier choices, by eating less sugar and bad-for-you foods and increasing your intake of whole foods, fruits, vegetables and lean proteins. When you eat better, you feel better, it’s simple as that! And when you still get to eat the food you love, mixed with healthier, more nutritious alternatives, it’s the best of all worlds! You’re filling your body with fuel while also losing weight, and it doesn’t get much better than that! When I was in high school, I had a friend that was on Weight Watchers. She received meals to eat each day and I have to admit, I was not jealous of her lunches. But with the Weight Watchers points system, you can create meals with health and weight loss in mind, without giving up taste. With meals ranging from cinnamon applesauce pancakes to chicken taco salad to pumpkin cheesecake wontons, you can have your cake and eat it too! These homemade meals are easy to make, and they’ll have you loving your Weight Watchers meal plan. Also make sure to measure out portion sizes. Portions of food have become increasingly larger in the North American culture, both at restaurants and in our own homes. Creating smaller portion sizes ensures we aren’t overeating, which leads to unnecessary weight gain. If you’re used to large portions, it may be tough at first, but once you train you body and mind to expect smaller portions, you’ll be satisfied with a reasonable plateful. This Weight Watchers kitchen scale are a great investment if you struggle with overeating. All the points below are Weight Watchers SmartPoints, not to confuse them with Weight Watchers Points Plus, which is the old point system. And keep in mind the points are per serving. You’ll quickly notice that with living the Weight Watchers lifestyle, you won’t have to give much up at all! If you’re new to Weight Watchers or thinking about getting started, I hope these Weight Watchers meals with points have impressed you! They’re healthy, delicious and will help get your weight back on track! If you liked this collection of Weight Watchers meals with points, please share it on Pinterest! And if you’re looking for more healthy tips and tricks to help you lose weight and get back in shape, please follow our Health board where we share the latest and greatest tips and tricks!